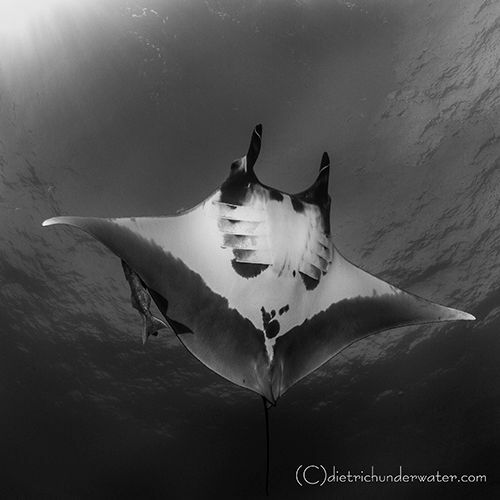 I’ve taken two trips to Socorro, Mexico in the last two years, where I was fortunate enough to have some awe-inspiring encounters with manta rays. Manta rays are in the eagle ray family, and the rays I encountered had an average wingspan of between 18 and 23 feet across. 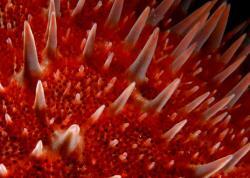 Regardless of manta ray size, there are basic fundamentals that can help you capture great manta ray shots. The approach should really be more of a non-approach. 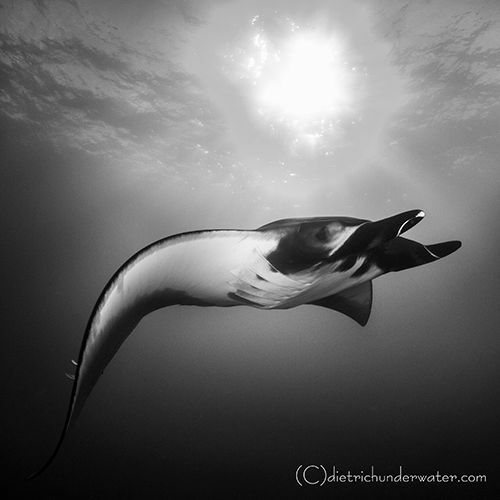 Sheer photographer instinct and adrenalin will make you want to swim toward the mantas, but here’s where I say “Stop.” Let the manta approach you… for a couple of reasons. 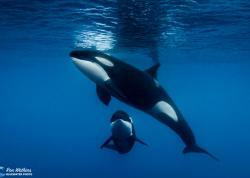 First, it allows them to set the tone for your encounter and allow them to establish their comfort level with you as a diver. 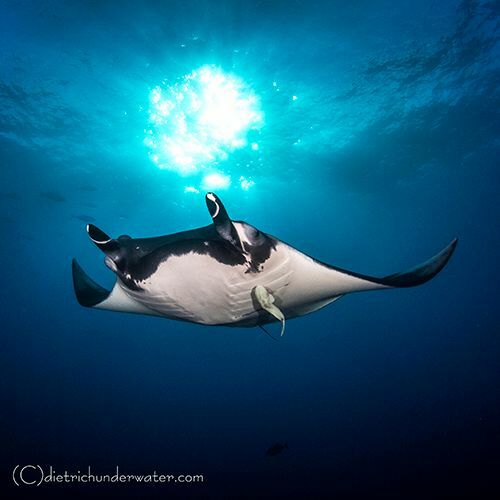 Second, it allows you time to position yourself in relation to the sunlight so you don’t lose a great shot because you were too busy swimming toward the mantas, forgetting about the sun’s positioning. I would expand this positioning tip to say, “When possible, separate yourself as much -- and as safely -- as you can from other divers” to help avoid bubbles, a random leg or equipment from other divers ending up in your otherwise perfect shot. 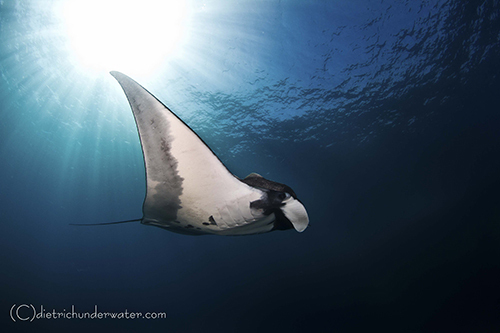 In my opinion, the sun is the most important lighting tool when photographing manta rays. The sun serves as a great backlight and can add drama and mystique to any photo. 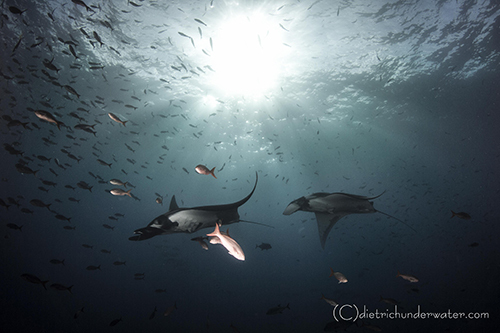 Due to the size of the mantas I swam with, a two-strobe setup is a must, as one strobe can’t handle the job of lighting such a big subject. The strobes will even out the lighting and fill in the shadows, creating a properly lit image. 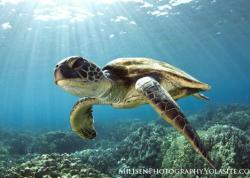 This is simple: go as wide as you can (for example: SLR: Tokina 10-17; Compact: any wide-angle wet lens). The wide-angle field of view allows the photographer to fit the scene into the frame and to get as close as possible to the manta. It also helps provide good clarity and allows the strobes to light the subject properly. Swimming with manta rays is an amazing experience in itself. It’s important to remember that not every image will be perfect every time. I encourage my students to plan, to think and to take a chance in setting up for the right shot. And sometimes, that shot winds up being the perfect shot.